With deliveries across Asia Pacific the Leonardo AW189 super medium helicopter is becoming the leader in the firefighting market. The Malaysia Fire and Rescue Department (Jabatan Bomba dan Penyelamat Malaysia) and Korea’s Seoul Fire Department are beginning operations with their AW189s and will soon be followed by the Tokyo Fire Department. Asia Pacific is the region with the strongest growth prospects for all of Leonardo’s aerospace and defense capabilities. 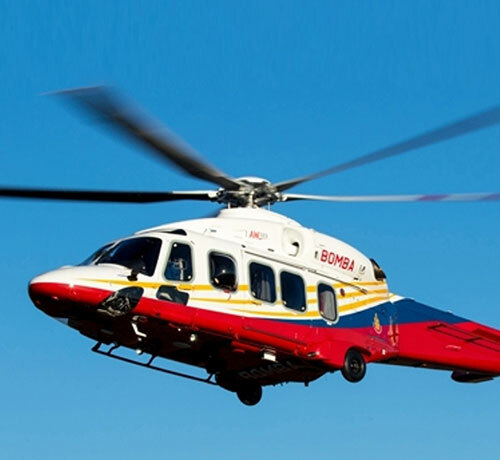 In the helicopter sector, public utility operations such as firefighting, search and rescue and disaster relief capabilities are quickly growing and Leonardo is successfully targeting the requirements with the AW139, AW169 and AW189 helicopters. These models join an already impressive fleet of Leonardo helicopters across countries in the region with Malaysia, South Korea, Japan and Australia being markets where Leonardo is leading in many sectors. Leonardo was the world’s number one civil helicopter manufacturer in terms of value in 2018 with a 40% market share, a 7% increase on 2017. Leonardo continues to play a major role in the Malaysian helicopter market expanding its presence and increasing its capabilities through a continued plan of investment. With a regional hub for Customer Support and Training near Kuala Lumpur, Leonardo has been present in the region for many years with hundreds of helicopters performing missions such as offshore and passenger transport, utility, homeland security, law enforcement, search and rescue, emergency medical services, maritime patrol, military naval roles and armed reconnaissance. Additionally, Leonardo is providing a range of security and defense capabilities to the Malaysian government and products, such as air traffic control systems to commercial customers. Leonardo, a global high-technology company, is among the top ten world players in Aerospace, Defense and Security and Italy’s main industrial company. Organized into five business divisions, Leonardo has a significant industrial presence in Italy, the United Kingdom, Poland and the USA, where it also operates through subsidiaries such as Leonardo DRS (defense electronics), and joint ventures and partnerships: ATR, MBDA, Telespazio, Thales Alenia Space and Avio.